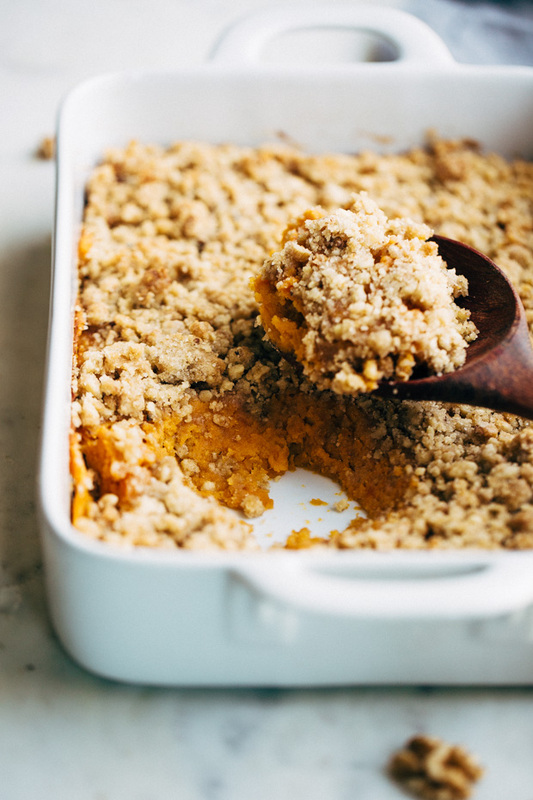 A quick and easy sweet potato casserole made entirely from scratch! 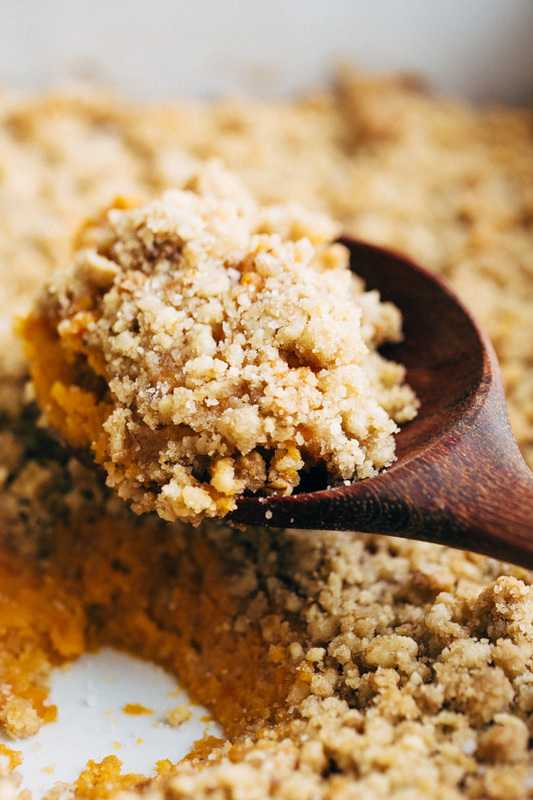 No canned sweet potatoes in this recipe and it tastes so perfect with that crunchy brown sugar topping! Today’s post is sponsored by California Walnuts ! We are using their delicious walnuts in the crunchy brown sugar topping of this Thanksgiving side dish. I’m back in Texas. My mini vacation is over. for now. Whamp whamp. 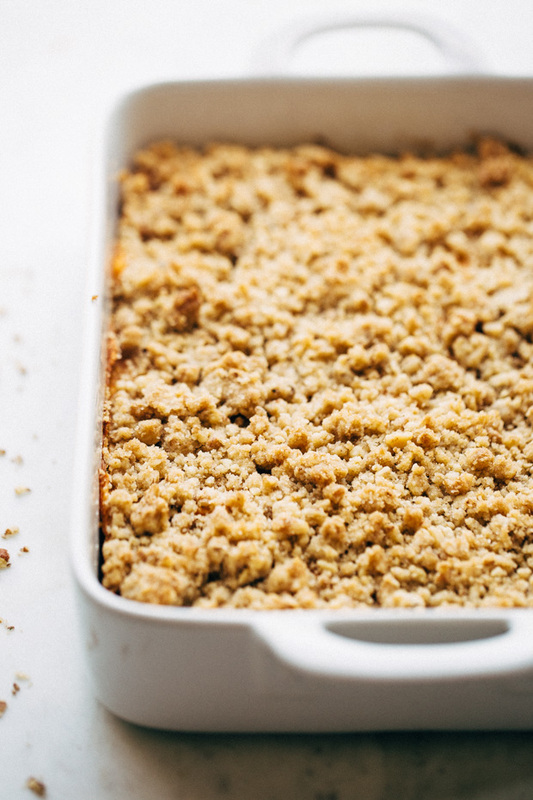 But on a much more positive note, we’re continuing our jump into Thanksgiving recipes! It’s my favorite food-centric holiday. Mainly because the line between dinner and dessert are so easily blurred around this time. Just the other day I heard someone say their family eats sweet potato casserole for dessert. We usually have it with Thanksgiving dinner because dessert is all about that PUMPKIN PIE in our house. But really, I could eat sweet potato casserole all year round for every meal of the day. It’s a rich, velvety, and straight up, it’s a sweet potato souffle, only no one really calls it that because wow, does that sound daunting or what? And i’ll do you one better, instead of going the tradition, slightly boring route, we’ll swap out the pecans for walnuts. And I know, you’re thinking what?! 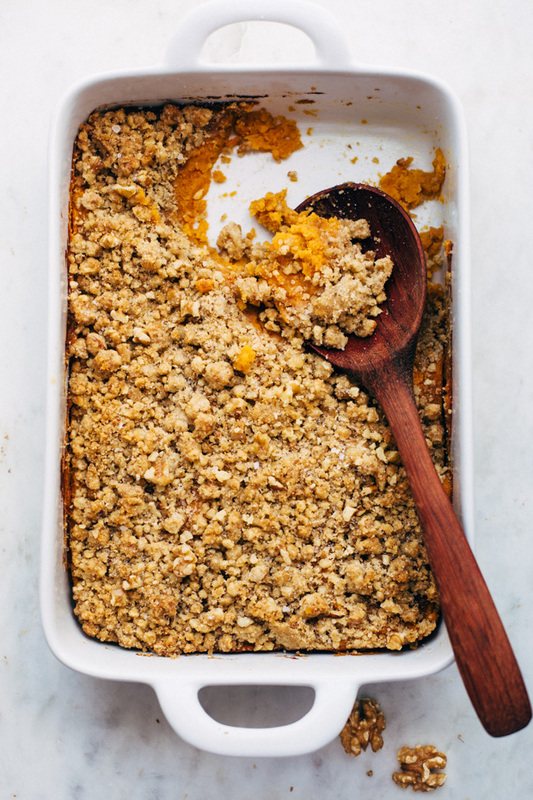 But brown sugar and walnut topping on a sweet potato casserole is everything. ?? No offense to the turkey or anything but to me, Thanksgiving is all about the sides. Because when you have this sweet potato casserole, a traditional green bean casserole  complete with crunchy fried onions, brown butter honey-glazed carrots , THE BEST 1-hour dinner rolls , and homemade cranberry sauce on the dinner menu, the poor bird sort of just becomes an after thought. When was the last time you heard someone say the turkey was the most memorable food they had on Thanksgiving? Pretty much never, right? But trust me, no one is forgetting this sweet potato casserole anytime soon. We traditionally make them without the marshmallows on top because crunchy brown sugar topping loaded with walnuts has my heart. ❤️ I wouldn’t mind the marshmallows if I was catering to the dessert menu but just something about turkey and marshmallows doesn’t work in my brain. We start this recipe by baking or microwaving fresh sweet potatoes.There are no canned sweet potatoes in my sweet potato casserole. And unlike most recipes, there’s NO boiling the sweet potatoes either. I feel that boiling them really takes away a lot of the nutrients and not to mention, most of that beloved sweet potato flavor. I’m a firm believer is fresh, simple, delicious, and most of all easy recipes. Why should Thanksgiving dinner be any different? I like to ‘bake’ the potatoes in a microwave to make this sweet potato casserole recipe quickly and easily. About 7-8 minutes for 2 potatoes. I used a total of 4 so after the first two were done, I baked the next two. You can do them all at the same time as well, but I find that sometimes they cook unevenly when you crowd the microwave. While the potatoes are ‘baking’ just whip up that crunchy brown sugar and walnut topping. 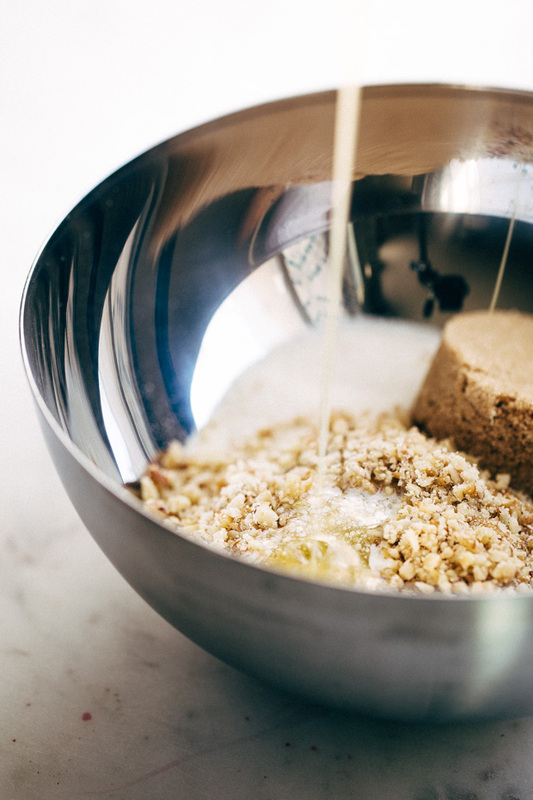 You’re going to melt the butter in a small bowl and start whisking the flour, light brown sugar, granulated sugar, and 3/4 cups of chopped California Walnuts  in a separate bowl. 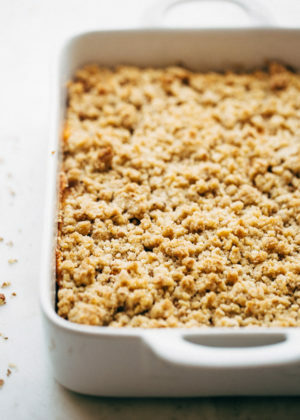 Totally optional but equally delicious in this casserole topping, a small pinch of cinnamon.The walnuts add such a nice texture and nuttiness to the crumb topping. Plus you really can’t go wrong with walnuts tossed in melted butter and sugar! When the sweet potatoes are cool enough to handle, scoop out all that flesh into a large bowl. Use a potato masher if you want your casserole to have more of a chunkier texture. 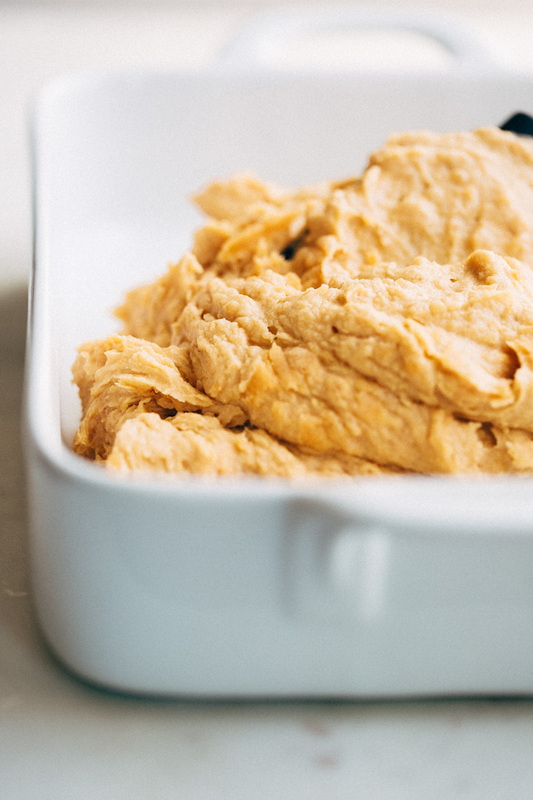 You can also whip it all together in a stand mixer or with beaters if you prefer a more smoother texture like we do. Then we’ll fold in some melted butter, sugar, a pinch of salt, a bit of vanilla, cream, and 2 lightly beaten eggs. You can certainly use milk for this recipe but since this sweet potato casserole is for Thanksgiving, I tend to swap the milk out for some heavy cream. The cream adds such a nice rich and creamy texture to the whole dish. Trust me, this isn’t a potato casserole the family if going to forget! Plus, we’re only using a 1/4 cup of heavy cream in total so really, even if you ate 1/4 of the casserole, all you’d eat is 1 tablespoon of heavy cream. And you’ll really only enjoy this casserole once or if you’re lucky, twice this year, so I say make it count. Maybe do a quick jog around the block before dessert to help balance the calories a bit? Just my two cents on the matter. Spray your casserole dish with nonstick cooking spray so the casserole just easily comes up. And just spread the whipped sweet potatoes in the casserole dish. Sprinkle with the brown sugar topping and just let it bake. You’ll know the casserole is done when the edges start pulling away from the sides of the dish. It’ll take around 30-40 minutes in the oven. I sprinkle my casserole with a small pinch of flaked sea salt when it’s hot and fresh out of the oven. 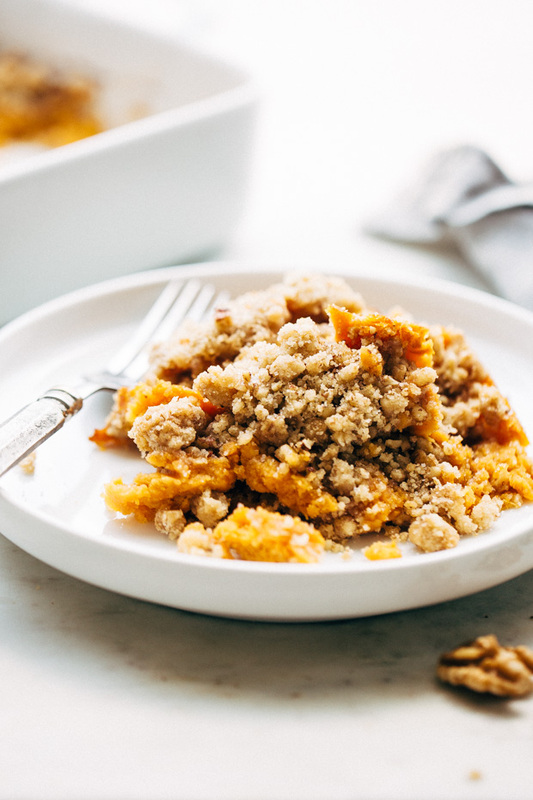 Something about the flecks of salt make this sweet potato casserole so completely irresistible. And it completely balances out the flavors. And just like that, magic hits your Thanksgiving table. The perfect balance of crunchy and creamy, sweet and salty. Grab the recipe and get this one on the menu, everyone will love it! Position a rack in the center of the oven and preheat the oven to 350ºF. Grease a 9×13 baking dish, set aside. With a fork, pierce the sweet potatoes at least 8-10 times, rinse the sweet potato and wrap each sweet potato in a paper towel. Microwave 2 potatoes for 7 minutes (flipping halfway through). Repeat with the last 2 potatoes. Alternately, you can bake the potatoes in a 400ºF oven for 45 minutes to an hour. I find the microwave does the job well and doesn’t take forever, but either way will work! In a small bowl combine the walnuts, flour, brown sugar, and granulated sugar and whisk together using a fork. Use the fork to stir while you pour in the melted butter. You’ll notice the crumbs start to form. Break up any large bits with the fork. Place the bowl in the refrigerator while you make the sweet potato casserole. Slice the potatoes down the center and scoop out the flesh using a large spoon. Place the potatoes in the bowl of a stand mixer and beat the potatoes until smooth (or leave them a little chunky if you like!). Add the eggs, melted butter, brown sugar, granulated sugar, heavy cream, vanilla, and a small pinch of salt and just fold. Pour the batter into the prepared dish. Top with the prepared walnut brown sugar topping. Bake, the casserole for 30-40 minutes or until the edges start to pull away from the sides of the dish. Remove the dish from the oven, sprinkle with a big pinch of flaked sea salt, if desired. Allow the sweet potato to cool for 10 minutes before serving. 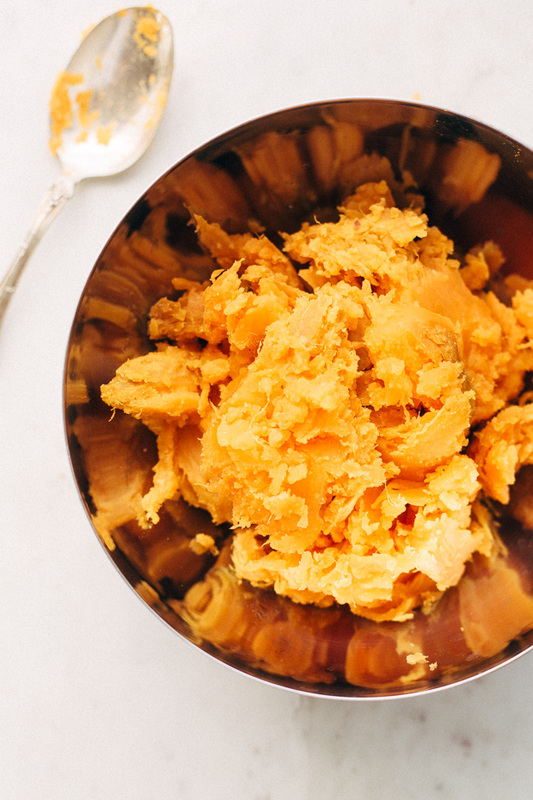 MAKE AHEAD: You can make this sweet potato casserole ahead of time by preparing the sweet potatoes, mashing, and storing in a container in the refrigerator. The same can be done with the brown sugar topping. On the day of, completely the sweet potato casserole (by adding butter, eggs, cream, vanilla, etc. )and bake just before serving. Thank you to our friends over at California Walnuts  for sponsoring this post! 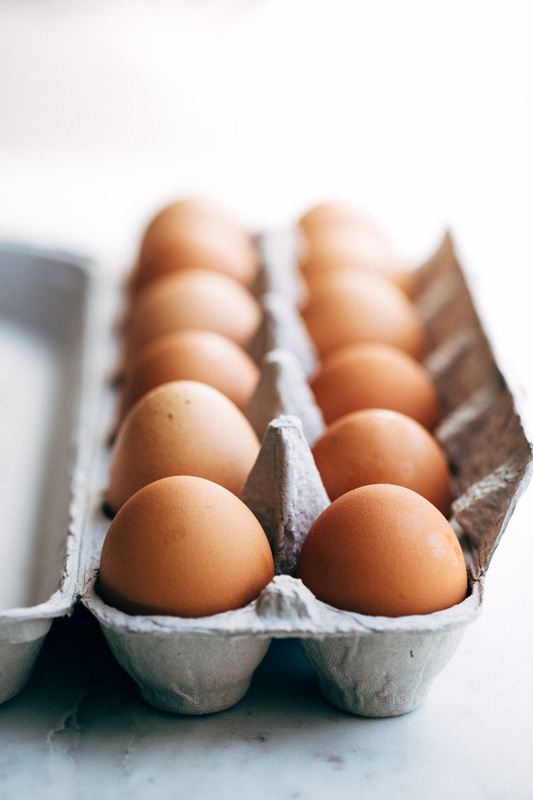 We truly love partnering with companies that promote wholesome, quality ingredients!